As if Poland’s Extreme Metal scene didn’t have decades of controversy, excellent musicianship, and internationally recognized bands such as BEHEMOTH and VADER underneath its belt already, emerging from Gliwice with their third full-length record are none other than EMBRIONAL. 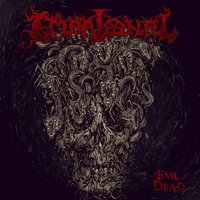 “Evil Dead” is comprised of ghastly production, grandly executed vocals, and concise instrumentals glazed with decay and reeking of pure death. The album is initiated by its title track, “Ending Up On The Gallow,” with the ring of the guitars welcoming the listener eerily at first, only to indulge them in a storm of technicality, brutality, and the occasional acoustic twang to remind the audience that there is something lurking within the shadows. To create a unique Death Metal experience, percussionist Młody pounds the kit relentlessly during “Vileness,” pumping adrenaline through enlarged veins to heighten the atmosphere created alongside modest guitar riffs and a thundering bass. The murky tone submitted by this band is no foreign concept; however, it introduces elements of atmosphere that aren’t always accomplished within other forms of Death Metal that rely on brutality. These include a lighter form of rhythm accompanied by a hefty amount of noisiness produced by the pondering bass and gravelly but quintessential vocals. Along come tracks “Inhuman Lust” and “Lord of Skulls,” – whose titles self-explanatorily carry on the general theme of the album. The band subtly rely on anti-religious notions to convey their all powerful message of death and destruction, including “Day Of Damnation,” and “Endless Curse,” which aren’t too God friendly; although, they definitely don’t need to be. Guitar work and percussion consistently emphasize each other. The drummer rarely takes a moment to breathe between delivering a powerful double bass rumble and appropriate fills. As mentioned, each guitarist delivers a demonizing effect through their tone and capability. It would have been interesting however, to see the vocalist experiment with high screams mixed in more with the low screams. Variation in vocal style under this circumstance would have a unique place on the record, and in the future, could benefit the band’s songwriting a great deal. During the last ten minutes of this energetic conquest, we are greeted by none other than a quiet introduction, that spirals into a heavier build-up that slowly provokes the vocalist. Sound familiar? As someone who hasn’t heard of EMBRIONAL before, I found myself appreciating the barbarity crafted by these musicians and hope to delve deeper into their discography as times goes on - and will definitely check out their past releases. This band makes a fairly good impression on the casual Death Metal listener - as well as the long time listener - giving both something to work with before they can form an opinion. I can assure you that you are not wasting your time with EMBRIONAL, and while they haven’t created anything entirely new, their new record belongs in the collection of any Extreme Metal fan. Those who claim metal lyrics are incomprehensible and lack a purpose are invalid. With “Evil Dead” the listener can experience a wide range of emotions through the gift of songwriting, especially in the rancid form of a Death metal, riff soaked blood bath.